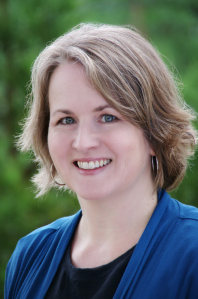 Shari Green is the author of Missing Mike, a new novel for kids. The story was inspired by the wildfires in British Columbia in the summer of 2017. Green has also written Root Beer Candy and Other Miracles and Macy McMillan and the Rainbow Goddess. She lives in Campbell River, British Columbia. Q: Your middle grade novels are written in verse--why did you choose that format? A: Free verse is the format the comes most naturally to me. Still, that doesn’t mean the format is right for every story I want to tell, so with each of my verse novels, there were additional reasons I opted for verse. 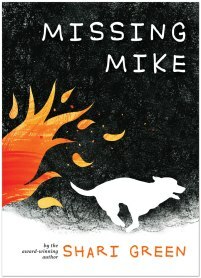 With Missing Mike, it was the intense images and emotions inherent in the events – wildfires, evacuations, leaving and losing home, and desperate concern for a missing pet. Those are difficult situations, for sure, and they evoke some tough emotions which could potentially be overwhelming for kids. The verse format, with its pared-down story-telling and ample white space on the page, seems to make the hard stuff more palatable, perhaps by giving readers room to process and reflect on the emotions. Q: What do you think the novel says about the bonds between kids and their pets? A: I imagine it depends on the particular kid and the particular pet, but for sure there’s the potential for an extraordinary bond. My experience is mainly with dogs, so I’ll narrow the focus a bit here: dogs offer unconditional love, and in a kid’s turbulent world (family stress, trouble with friends, school difficulties, bullies, etc. ), that love can be a lifeline, offering real comfort. Q: How important is setting to you in your writing? A: I love stories with a strong sense of place. In my own work, the importance of setting has varied a bit with the story, but it always matters. 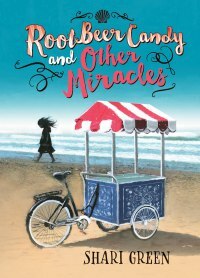 In Root Beer Candy and Other Miracles, the beach/island setting is very much entwined with the plot, and of course Missing Mike’s story arises directly from the setting (the encroaching wildfire causes the evacuation that is the inciting incident). 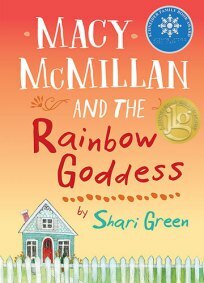 In Macy McMillan and the Rainbow Goddess, it’s the “micro settings” that are key – Macy’s garden, Iris’s kitchen, the houses they are both leaving. A: It’s still in the early stages, so I’m not going to say much! I can tell you it’s a contemporary middle grade novel that includes friendship and hockey and mental health issues. --Interview with Deborah Kalb. Here's another Q&A with Shari Green.